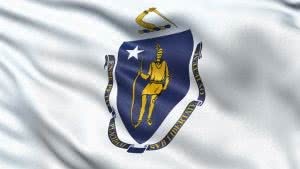 Massachusetts officially the Commonwealth of Massachusetts, is a U.S. state in the New England region of the northeastern United States of America. It is bordered by Rhode Island and Connecticut to the south, New York to the west, and Vermont and New Hampshire to the north; at its east lies the Atlantic Ocean. Massachusetts is the 7th least extensive, but the 14th most populous and the 3rd most densely populated of the 50 United States. The state features two separate metropolitan areas – the eastern Boston metropolitan area and the western Springfield metropolitan area. Approximately two thirds of the state’s population lives in Greater Boston, most of which is either urban or suburban. Some of the largest U.S. companies, including Liberty Mutual Insurance Company and Raytheon, maintain their headquarters in Massachusetts. Massachusetts requires corporations to have names that can’t be confused with any existing entity, reserved or trade name. Company Express will research your company name to make sure it meets Massachusetts’ standards. Required documents: Articles of Organization filed with the Secretary of the Commonwealth. Turnaround time: 7-10 business days. Minimum number: Corporations must have no fewer than three directors, unless there are two or fewer shareholders. In such case, there may be one or two directors. Appearance in articles: Required. Director names and addresses are required to be listed in the Articles of Organization. Corporation’s principal office may be located outside of the state. Local REgistered Agent is required. Time to file: Annual reports should be filed two and one half months after the close of the fiscal year. Massachusetts requires Limited Liability Companies to have names that can’t be confused with existing entity name, reserved name or trade name. Company Express will research your company name to make sure it meets Massachusetts’ standards. Required documents: Certificate of Organization filed with Secretary of Commonwealth. Turnaround time: About 7-10 business days. LLC’s principal office has to be located inside the state. Local registered agent is also required. Time to file: Annual report must be filed before the date that marks the anniversary of the initial filing of the Certificate of Organization.